The event kicked off at noon at the city’s birthplace, La Placita, with a welcome from Archbishop Gomez, who led a walk for life together with the Archdiocese’s auxiliary bishops from Olvera Street to LA State Historic Park for the official program and celebration. Keynote speaker Lizzie Velasquez, a global motivational speaker, YouTube personality, anti-bullying activist and author, shared her story of overcoming bullying, which she started to suffer at a young age due to her appearance caused by a rare disorder that prevents her from gaining weight. The fact that she is vision-impaired only added to the challenges she faced. Velasquez shared how the unconditional support of her family helped her become a strong woman and motivate others to speak up against bullying. Read more on Lizzie Velasquez in Angelus News. Abby Johnson, a former Planned Parenthood director who became a prominent anti-abortion activist after resigning in 2009 also addressed the audience. “For me, it’s been a journey of healing to know that the world is seeing me when I was at my worst but also gets to see my heart changing and the ultimate redemption through the grace of God,” said Johnson, who will be portrayed in the movie “Unplanned,” based on her book with the same name. Read more in Angelus News. Beatriz Sandoval, formerly a homeless mother who uses her experience to fight homelessness and poverty in LA, shared in Spanish her story of financial and mental struggles that she and her family overcame in part with the support of their church community. The event was emceed by Gloria Purvis, host of EWTN Radio’s Morning Glory, and by Damon Clarke Owens, founder and executive director of JoyToB, a ministry centered on St. John Paul II’s Theology of the Body. Other speakers and performers included Dr. José Villela Vizcaya, a Mexican psychiatrist who, as a medical student, faced a car accident that left him without mobility and sensitivity in most of his body. He became a renowned public speaker, and is currently a Paralympic swimmer, ranked in the top 10 within his category. Rick Smith, founder of Hope Story, an organization based on his own family’s experience, which provides inspiration and encouragement to parents who receive a prenatal diagnosis of Down syndrome. Two-time Grammy nominated singer and songwriter Jamie Grace, winner of the Dove Award for a new artist. Barbara Padilla, a soprano born in Guadalajara, Mexico, who received a bone marrow transplant after being diagnosed with stage 4 Hodgkin’s Lymphoma. With her husband Kyle they adopted their daughter Elizabeth. Nancy Sanchez, a three-time award-winning Jazz vocalist who combines pop and traditional Mexican musical elements to create a unique style. Mario Alberto Perez, a singer and songwriter who uses his talents to evangelize through music. Connor Flanagan, a hip-hop artist with a new take on music, who provides an authentic stage presence and unique musical experience. Ryan O’Hara, content director for Saint Paul’s Outreach, a national Catholic organization that ministers to college students on campus. He is a foster adoptive father of three sons. OneLife LA partners with local community service and outreach organizations to inspire positive action among participants. These organizations provide life-affirming support to pregnant women, assist the homeless, trafficking survivors, the elderly, the disabled and the dying, and help foster children find adoptive families. Partners this year included 40 Days for Life, By Your Side LA, CAST: Human Trafficking Coalition, Catholic Charities Esperanza, Covenant House, Family Promise, Foster All, Harvest Home, Los Angeles Pregnancy Centers, Olive Crest, Options United, and Santa Teresita: Carmelite Sisters End of Life. For more information, visit www.onelifela.org. For information on 2019 OneLife LA speakers and other details, visit https://onelifela.org/event-details/. 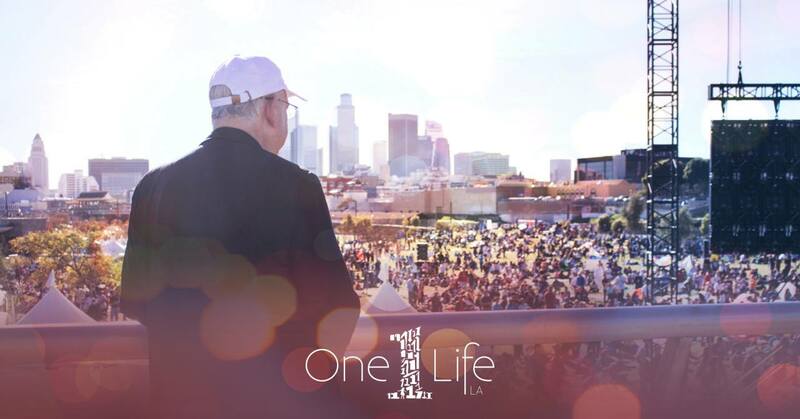 OneLife LA was first celebrated on January 17, 2015. For more on 2018 highlights visit https://onelifela.org/about/. Visit www.onelifela.org for more information. For OneLife LA updates, visit https://www.facebook.com/1lifela/, https://www.instagram.com/1lifela/, https://twitter.com/1lifela?lang=en, https://www.youtube.com/user/1lifela, and follow #OneLifeLA.